The great American hiring boom is slowing down--but as labor cools with the rest of the economy, a few choice regions will stay red-hot. You just have to know where to look. Biotech and pharmaceutical firms are adding thousands of jobs to Raleigh's economy. Raleigh-Durham remains America's top region for tech workers--and is expected to keep expanding faster than other tech hubs like Boston, San Francisco, and Seattle. Last year the metro matched the job-creation record it set in 2000 by adding 38,000 new positions. "This year is going to come in almost as high," predicts Wachovia senior economist Mark Vitner. 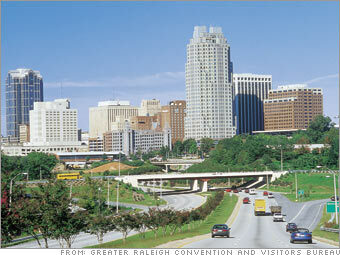 Like Washington, Raleigh-Durham has a large public-sector base that helps protect it from economic slumps. But its economy is more diverse than Washington's, with expansion in pharmaceutical manufacturing, biotech, and financial services. Raleigh's cost advantages keep drawing more top employers. This fall Fidelity Investments will open a $100 million tech center that will add 2,000 jobs, and Silicon Valley-based Network Appliance is expanding its operations division here. "Raleigh is cheaper," Vitner says, "and has one of the most highly educated workforces in the country." Sources: Conference Board, Global Insight, Moody's Economy.com, PayScale, and Radford Surveys & Consulting.